Sturdy wooden pallets perform an essential role in most businesses today. Use these well-constructed standard-sized pallets to keep your inventory clean and dry in a warehouse, during transit, or while awaiting loading. You’ll help prevent water damage and ensure your orders reach your customers in an attractive, unspoiled condition. We carry exceedingly economical selections in standardized dimensions. Constructed from heavy duty hardwood and reinforced with double faced sides, these products offer both utility and long lasting durability. These pallets include uniform deck spacing and notches for four way (or two way) entry. They permit air flow beneath and around their contents. Whether you need to ship, store, or display foodstuffs, electronic items, machinery, or a variety of other inventory, you won’t regret investing in these top quality supplies! Fit these pallets conveniently onto skid loader extensions to facilitate easy loading and unloading. Stack them conveniently, too. They will withstand considerable hard use. The tightly fit wooden surfaces sit completely flush, allowing seamless storage and permitting these pallets to accommodate products placed on shelving or in tight corner locations. 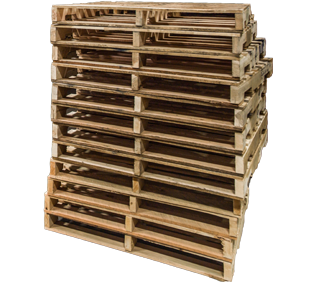 If you already utilize wooden pallets in your facility, consider replacing your worn or badly damaged units with some of these brand new pallets. You’ll discover a multitude of uses for these essential commercial items! Looking where to get wooden pallets? Let us quote your pallet specifications.